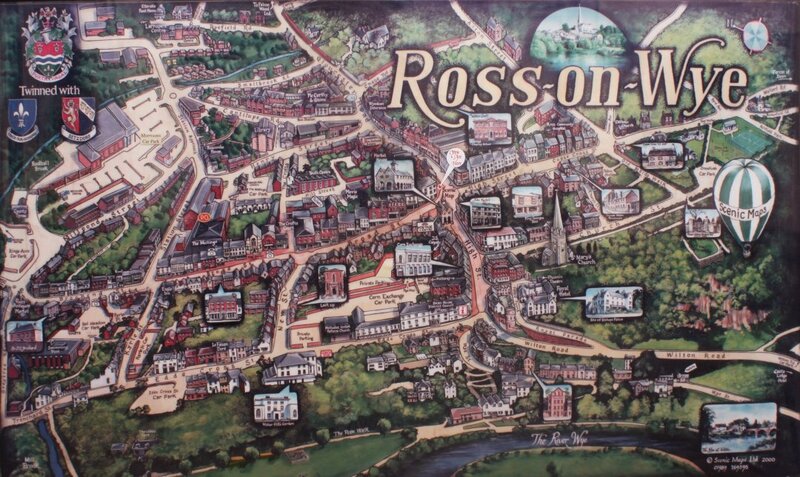 The original Ross-on-Wye town map stood at the west end of the Market House next to the post box. 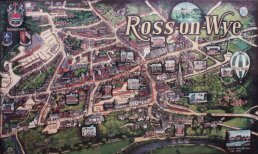 It was a full colour oil painting of the town and was created by local artist Douglas Eaton, who was well known for his paintings of the Forest of Dean area, in association with the Town Map Company of Ross. Amidst widespread acclaim it was unveiled by Sir John Harvey-Jones in April 1989. It was designed to be a central attraction for both visitors and townsfolk alike and soon other towns came forward with requests for similar maps. Further to this the efforts of the Town Map Company came to the attention of His Majesty The Prince of Wales and he wrote to them with his best wishes. The map, which measured four and a half by five feet, took the form of an aerial view of the town and was imaginatively crafted. Houses and roads were pictorially depicted with a colourful hot air balloon rising to the right hand side of the painting to add a three dimensional effect. Buildings of special interest or historical note were highlighted in boxes for the benefit of visitors to the town. Additionally hand painted in full colour advertisements surrounded the map and the whole picture was displayed in a steel, stove enamelled case with a toughened, laminated glass front and illuminated for night time viewing. In addition to the original, two copies are sited in the town's main car parks; one was in the Red Meadow Car Park by the swimming pool and the other at the top of Kyrle Street. It is the perfect example of commercial interests working hand in hand with local authorities to achieve a stunning result which is to everyones' benefit. Since then the map has been moved to the central cross road in the town and has been copied and updated as the location of key places of interest have moved (such as the Tourist Information Centre).